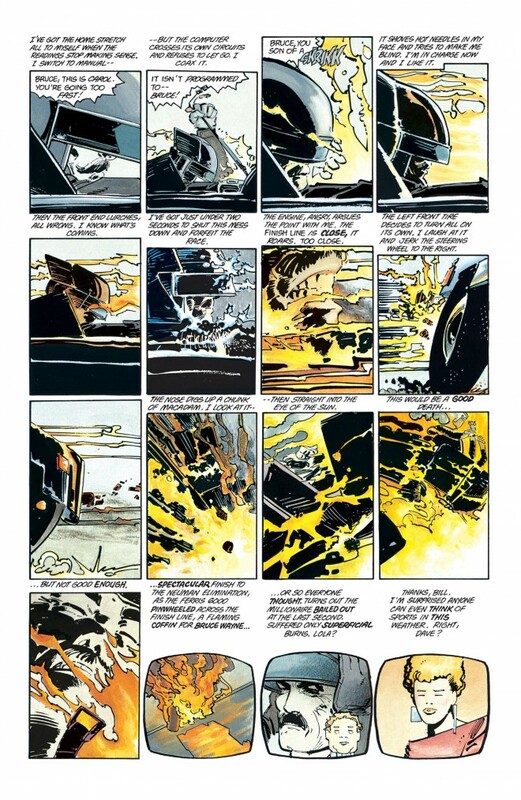 In Part 1 (click here), creators remembered their initial impressions of Miller’s landmark work. In Part 2 (click here), they discussed how it work influenced them as storytellers. 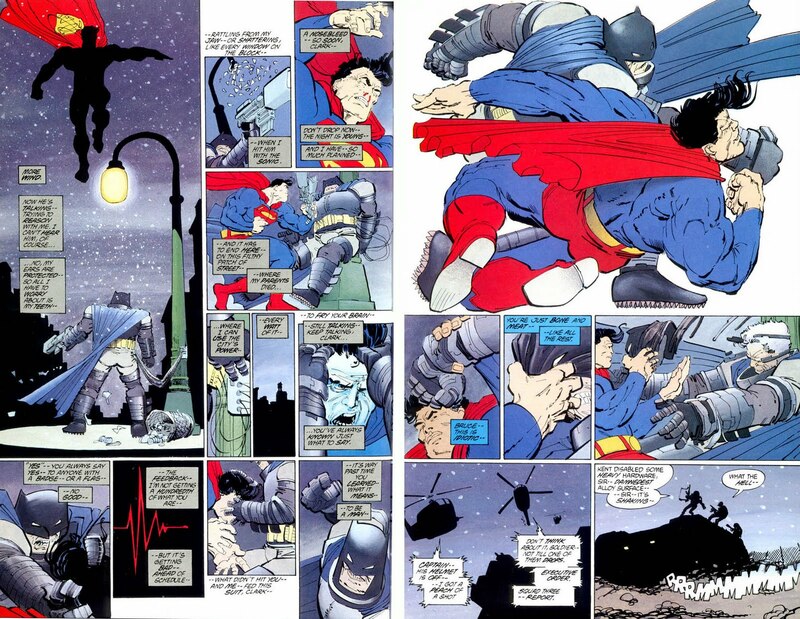 My own 13 QUICK THOUGHTS about The Dark Knight Returns‘ legacy (can be found here). One?! Sigh. I guess if my feet are to the fire here, I’d say… You know, you’re mean to ask this question, right? This is like a “Pick your favorite son or daughter”-type question. Sigh. I’m going to say the confrontation between Batman and Superman. 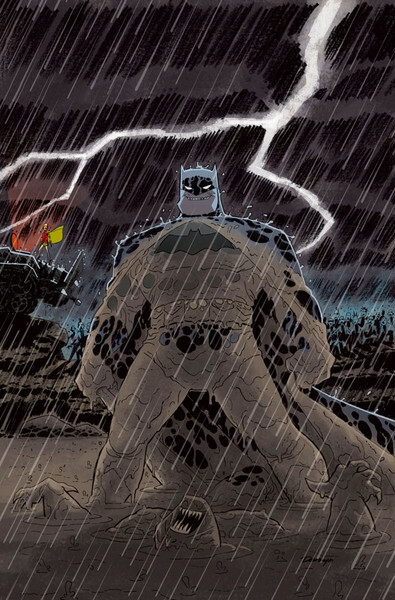 Bruce wired up to Gotham to power his armor…? That bullet nose helmet? Making Superman bleed?! I mean, c’mon! Love, love, loooove it! 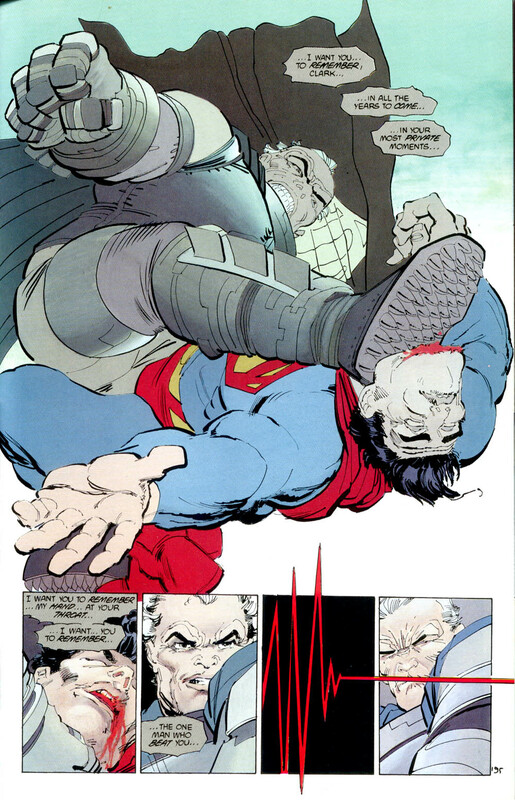 I think a lot of people gravitate to the battle between Batman and Superman, or the Joker snapping his own neck. That’s a brilliant page. But if there’s one moment that sums up the story for me, one image, it’s the stark splash of Bruce hugging Carrie from the second issue. 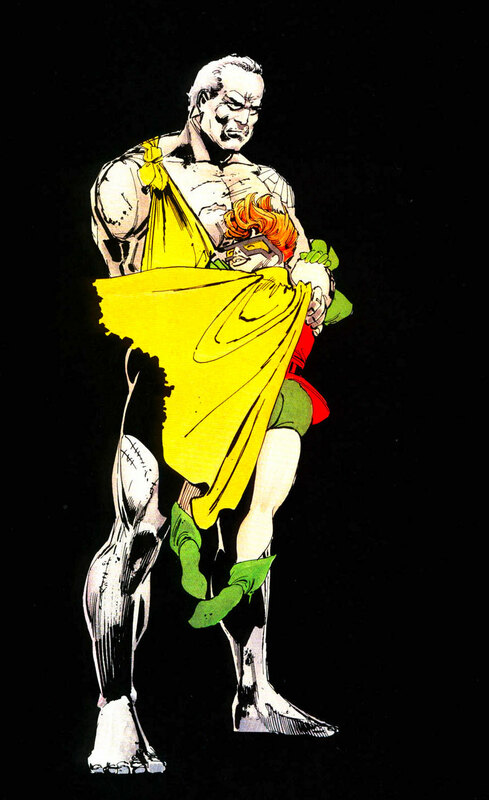 DKR is brutal and violent and even ugly, but that’s the moment for me, because it’s about love. The very first time you see Bruce in costume again — that full-page shot of him leaping out towards us. That blew my mind. “The other… hurts.” That fight with the robbers that takes place early in the book — it’s such a great minor payoff, one of those adrenaline rushes that the book keeps on giving through brilliant setups and pacing. 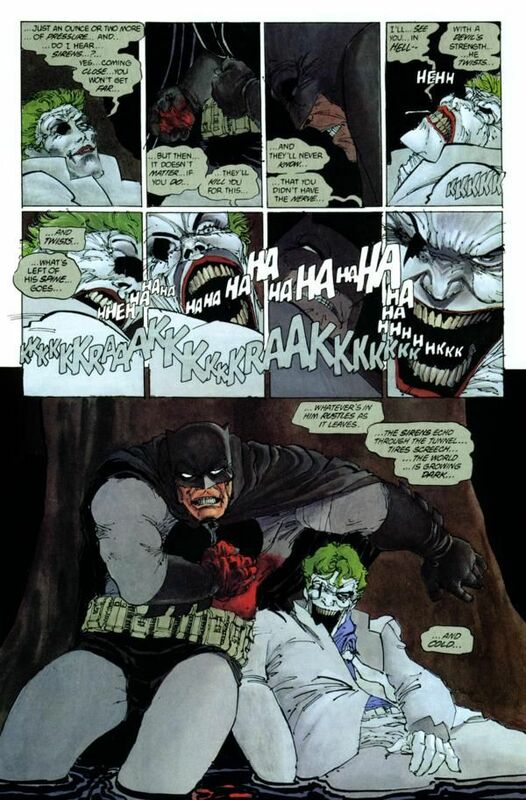 Perfectly delivered punchlines, or in this case, a Batman kick into the midsection. Just the most badass, perfect Batman line and scene. Years later I got to adapt this scene for Batman Adventures. It’s earlier on, but what I think really sold me was Bruce deciding not to die at the car race at the very beginning. It’s a very human character moment that sets up what Wayne is about right from the get-go, makes him relatable in a way a lot of writers struggle with. It would definitely be the mudhole scene with Batman’s line, “And I’m the surgeon.” It’s his comeback moment and I just love the brutality of that fight. The one I chose for my (variant) cover. 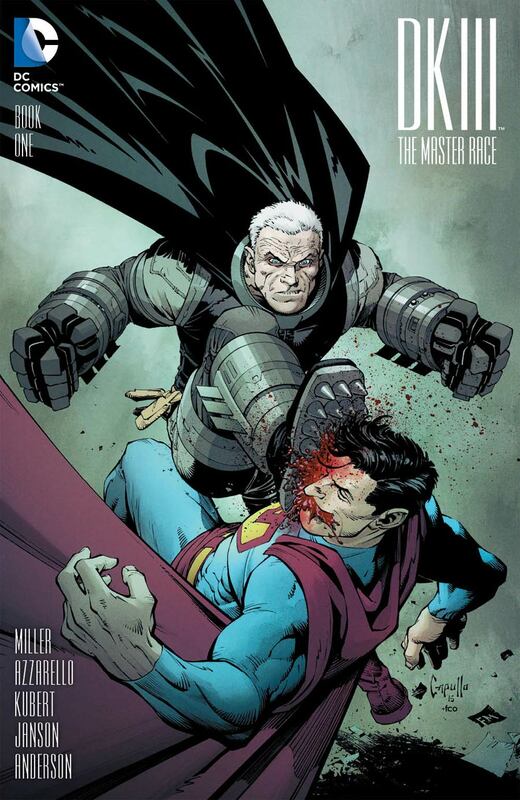 Batman actually believably taking on Superman. Wow. Never thought I’d see that happen. 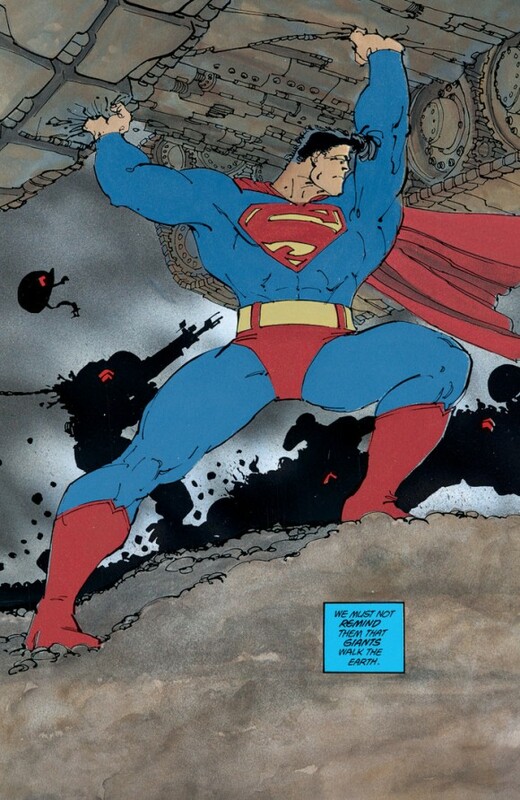 Obviously it’s a Batman story, but one of the moments that still takes my breath away is seeing Superman lifting that tank: “We must not remind them that giants walk the Earth.” It’s mythic. Indelible. I think for me it always comes down to the Superman/Batman fight. I still kind of hate Frank for that, lol. 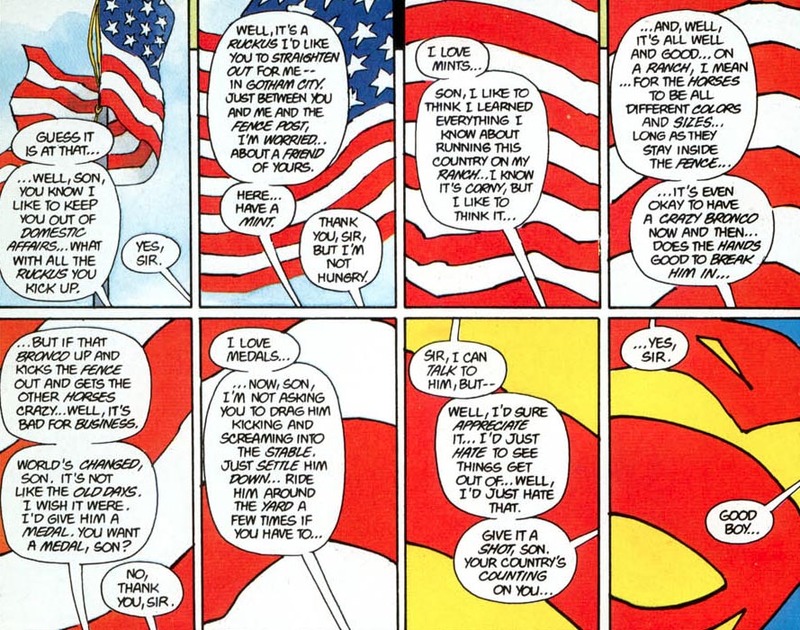 There are a ton a visual moments but the one that still gives me goosebumps is the transition between the American flag and Superman’s emblem. A brilliant use of design and iconography! When the Joker broke his own neck. I didn’t expect that to happen. 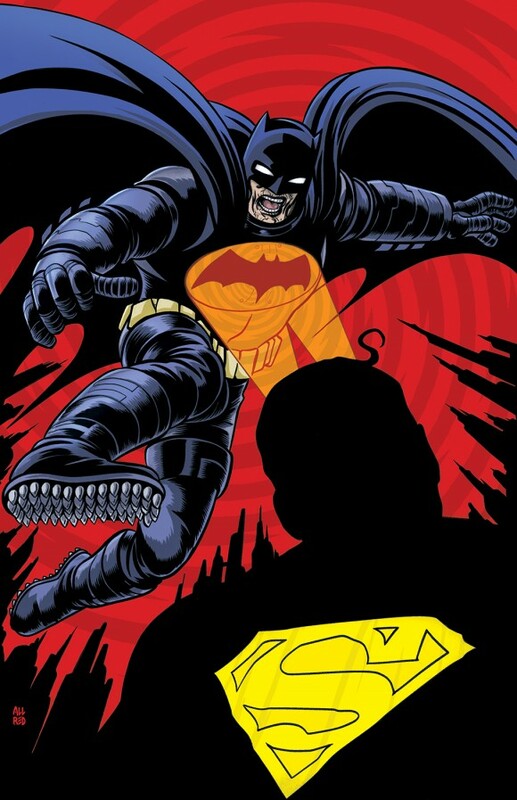 I thought the ending where Clark Kent realizes that Batman is still alive and then just walks away was fantastic. 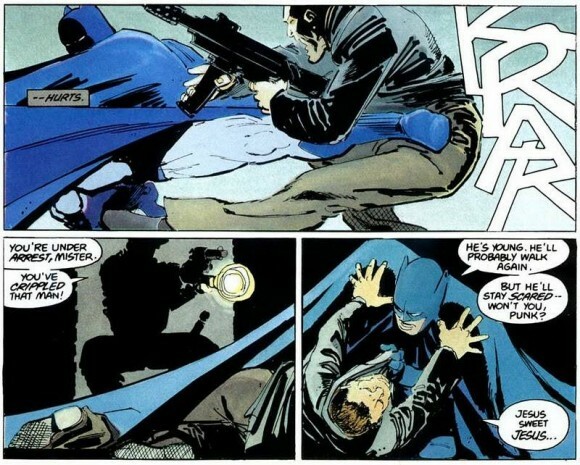 There’s a moment where Batman is waiting for a helicopter to arrive on one of TWO possible tower rooftops, and he can’t cover both of them, so he casually drops that he’s glad he brought a gun. 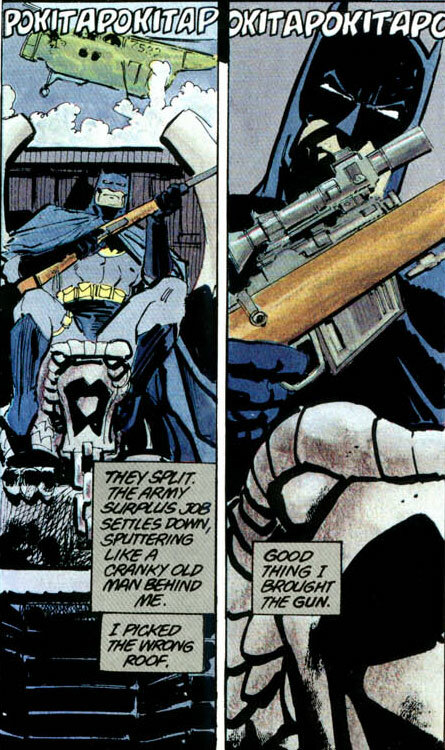 At the time, Batman was gun-o-phobic (he still is to some extent) and the line was SUCH a departure from regularly scheduled Batman that it cemented the idea that it was a brand new world, a different set of experiences, an older, changed character. All in six words. Now, I’m also gun-o-phobic, so it was a jarring moment for the character, but it was fair game in the terms of the same story with an armless Green Arrow and a retired Batman. Impossible! 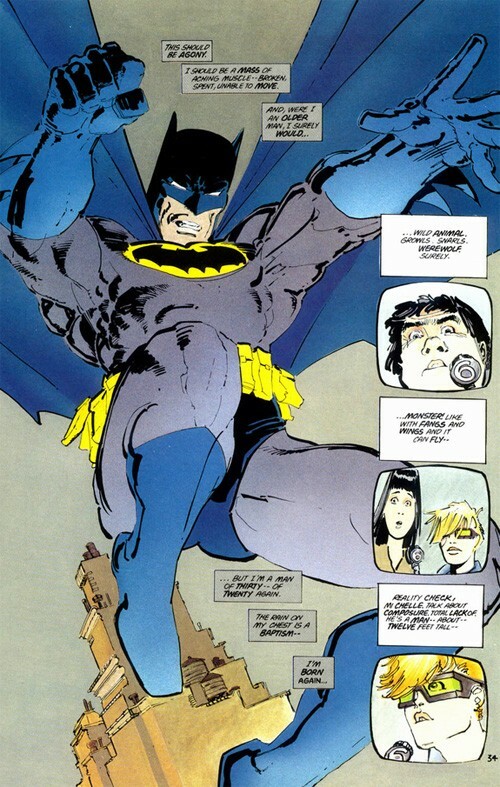 But the moment that sticks out, that set the tone and absolutely made sure I was going to read it right through to the end, was the moment Bruce Wayne stands beneath a street lamp, and is surrounded by slice-and-dice’ thugs — thugs that basically back down and disappear because they can tell he’s “into it” without him even having to lift a finger. The man exudes menace and danger, and he’s on a kind of death wish… it was almost an Eisner moment. Pure noir. Brilliant! I really can’t say my favorite moment. As I read it, I SO wanted Clint Eastwood to play Batman in the film version!!! That, of course, never happened! I really dug finding out that Robin was a girl! 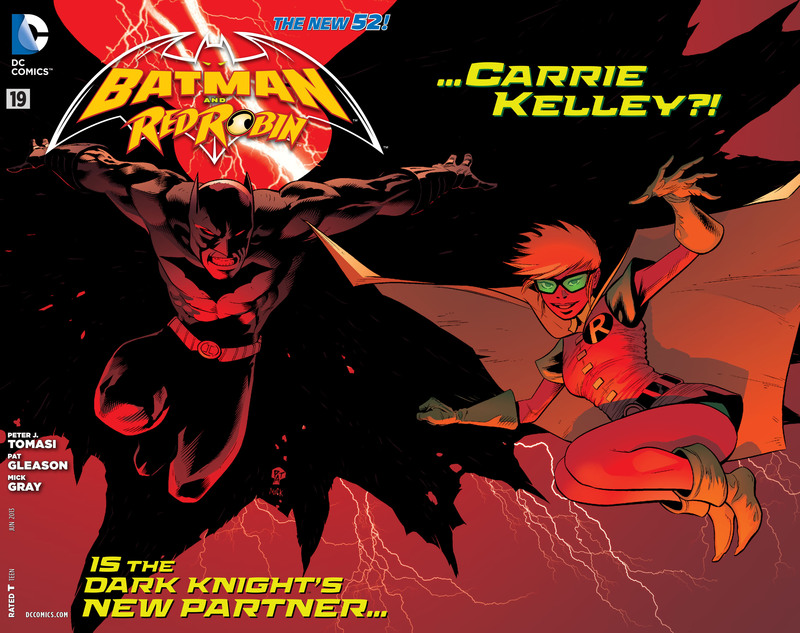 Carrie Kelley is a GREAT character and I’m SO glad we got to use her, a BIT, in Batman and Robin #19! I kept that COMPLETE issue in original art! 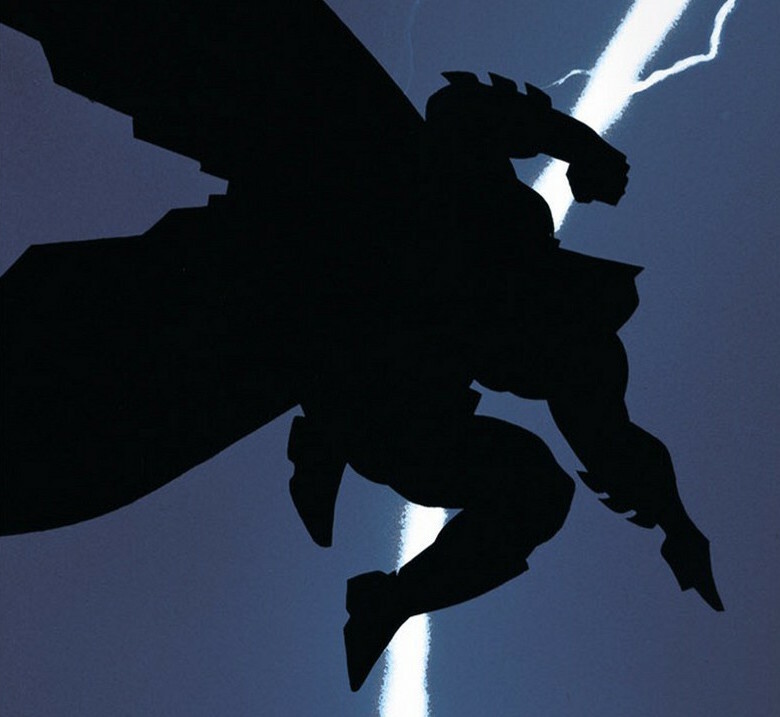 — THE DARK KNIGHT RETURNS: A Celebration. Click here. — Creators On the Lasting Influence of DARK KNIGHT RETURNS. Click here.